Matsumoto City is a small historic castle town of about 200,000 people situated at the southern end of the Azumino valley deep in the mountains of Nagano. 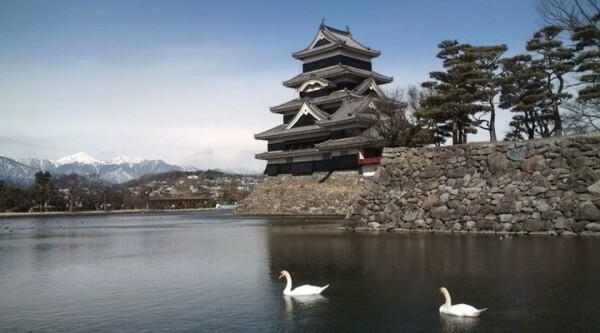 Matsumoto is famous for it’s superb castle, which along with only three others in Japan (Hikone, Himeji & Inuyama) is designated as a national treasure. The city includes many Meiji era heritage buildings such as the Kyuu Kaichi School, and brilliant museums such as the Japan Ukiyoe Hakubutsukan. To the west lie a string of 3000 meter (feet) high peaks that form part of the Japan Alps, providing a spectacular back drop to the city on clear day. To the east is the high mountain plateau called Utsukushigahara, with its panoramic views and many hot springs such as Asama Onsen. An old and historic town, Matsumoto is also young as the national university Shinshu Daigaku serves this part of the Chubu region – as a result there are many bars and restaurants catering for students. Gear and equipment for Hiking, Winter Sports and other outdoor activities is easily purchased, and a full range of shopping and other services are available. 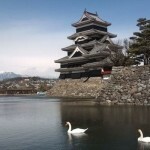 For travelers, Matsumoto is a key transport hub. Quick connections are available to Okazaki via Nagoya, Nagano City and Tokyo by express trains. The JR Ooito line snakes up the valley to Hakuba – a mecca for skiers with Happo One and Tsugaike Kogen amongst other resorts, while the Matsumoto Dentetsu line and the bus services provide access to the spectacular Kamikochi and Norikura. Winter is cold. The snow usually starts falling in late November and the January average temperature is zero celsius (about 32 degrees fahrenheit). The skies are often clear and the air crisp, you’ll need good tread on your footwear as the roads and sidewalks are slippery. In the spring the cherry blossoms bloom from mid-to-late April (later than lower altitude areas such as Okazaki or Kyoto). Best place to see the flowers is in the castle grounds and along the river banks. Average temperature in May is around 16 degrees celsius (60 fahrenheit). In the mountains surrounding Matsumoto the wildflowers usually bloom in June-July. Summer is very comfortable as it isn’t very humid. Average August temperatures are a pleasant 25 degrees celsius (77 fahrenheit). Autumn is beautiful. The leaves turn red and begin to fall in September along the famous Tateyama-Kurobe alpine route, and by the time the leaves in the city begin to change color in mid-October, the surrounding mountains are already white with snow. There is no particular tourist season, it is beautiful all year round, however when the flowers are blooming, or the leaves changing color (or if there is a festival), the number of tourists sharply increases – it is a good idea to book accommodation early, especially for low budget accommodation.